Whether its external render, lathe and plaster, plasterboard, backing plaster coats, pebble-dash, roughcast or finishing coats of all kinds we have the skill and experience to make sure that firstly, the correct pairing of plaster types are adopted and secondly, they are applied in the right circumstances. 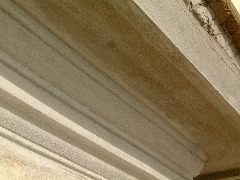 To the left we see the results achieved using the ultimate rendering skill of "running a mould" in a lime based render. This is completed on site "in-situ", using traditional skills methods and materials. New plastering on prepared new and modern substrates is one thing. But having the skill and patience to make sure that new marries into old when carrying out refurbishment is a rare thing these days. At Westoaks we ensure our plastering skills extend to the most difficult types of work. 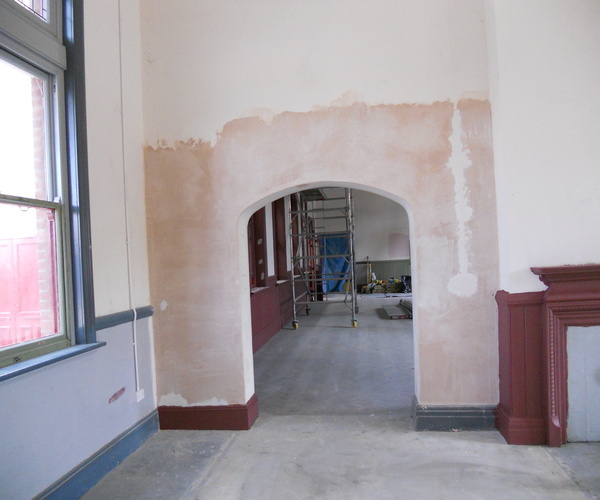 Here is an example of a finish coat area repair with a seamless joint to the existing surface. This saves effort and time for the follow-up trades keeping the overall cost to a minimum.